Some women refer to it as “the good ol’ boys network.” Other feel like there’s still a glass ceiling in the retail loss prevention industry. This first Women of Loss Prevention survey, put forth exclusively by LP Magazine and sponsored by Tyco Retail Solutions and Protos, provides a comprehensive look at how women view their current role in the loss prevention and asset protection industry, how they feel they are perceived as industry professionals, the role that they feel gender and gender bias has played in their ongoing career opportunities, and the responsibility of every LP professional to remain accountable for their own career growth and development. 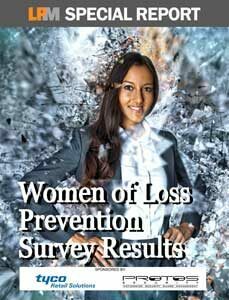 It’s a critical issue for all LP professionals—women and men alike—and that’s why LP Magazine worked with loss prevention executives in the industry to survey women and published this Special Report, Women of Loss Prevention Survey Results, for you to download FREE. The goal of the survey is to provide an objective window into the thoughts, ideas, and opinions of the women of loss prevention regarding these key areas and open doors for additional discussion. By offering an anonymous venue for women to openly voice their views on these topics, we can gain a more comprehensive understanding of how the women in our industry perceive these important questions, and perhaps spark fresh thoughts and ideas on how we can best address these topics to further enhance our loss prevention teams. Women of Loss Prevention Survey Results will stimulate your thinking about how women perceive their place in the retail LP organization. Download this FREE Special Report today and discuss the results with your asset protection team. Enter your email and we'll send a link to the Women of Loss Prevention Survey Results right to your inbox.